When it comes to creating responsive tables on WordPress sites, it’s pretty much possible to get stuck as WordPress has a very basic built-in solution in Gutenberg editor. If you’ve tried it, you might have already know the frustrations. But like everything, we can make it easier by using a Plugin. There are plenty of WordPress Table Plugins out there. However, it’s not easy to choose the right one from hundreds of solutions. To save your time, I am going to share a list of 10 Best WordPress Table Plugins for creating responsive tables in 2019. Now, it’s the time to explain the usage of these awesome plugins so that you can choose your desired one based on your requirements. Ninja Tables is a fully responsive plugin that lets you create different types of dynamic tables. The advanced features of the plugin make the users feel very much comfortable when they create tables. And a diverse type of ingredients in plugin interface makes it user-friendly. 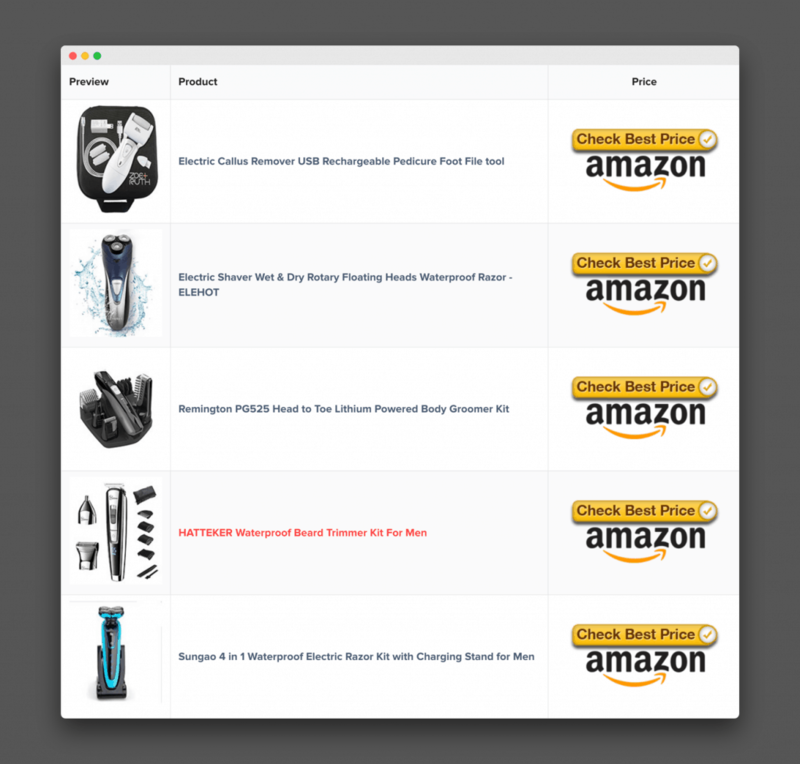 You don’t need to use any addons to have a responsive look using this plugin. The breakdown facility of the plugin allows you to solve the responsiveness issue in any kind of device. It also offers several table design, predefined schema, custom schema built-in, and custom CSS as well. Pagination, Sorting, and Filtering can be found in a very friendly manner. Using shortcode, you can post any of the tables you created earlier on your webpage. Drag and Drop Data Sorting. Ninja Tables is the most comprehensive WordPress table builder plugin. The only downside of the plugin is that it doesn’t have an option to import Excel file. Ninja Tables has both free and premium version. The premium plan starts at $39 for a single site license. You can use the coupon WPLEADERS to get 10% discount. TablePress is the most popular table plugin which appeared in the market with the name WP-Table Reloaded. Then it turned into the name TablePress. This is probably the first quality table plugin which grabs users’ attention. The shortcode facility of the plugin allows you to add created tables anywhere on your WordPress site. And export-import facility allows its users to have the tables from other websites. There are several advanced options like filtering, sorting, pagination with a simple outlook. The plugin is mostly responsive but you have to add simple add-ons to make the table fully responsive. The plugin offers several add-ons to add extra functionalities to your website. HTML Table Support For Data Cells. Support Table Caption, Header, & Footer. Import from CSV, Excel, Google Sheets. Export to CSV, Excel, and PDF. 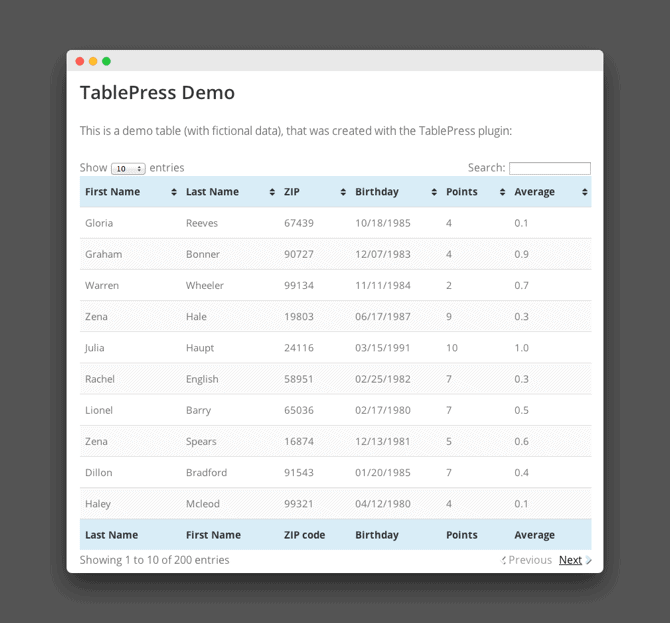 One of the great things about TablePress is, it lets you create any type of tables. As you can insert HTML code, you can easily make tables more attractive and engaging. TablePress is fully free and it doesn’t have any premium version. You need to have some HTML coding knowledge to create beautiful tables. wpDataTables is one of the notable premium WordPress table plugins. The plugin is rich with the perfect display to demonstrate data as charts, graphs, and tables. The plugin comes with many interesting advantages and its correlated features. Using this plugin you can create tables in various ways. You can upload your file, paste a MySQL query, provide URL, or just input the data manually. Sortable and interactive tables can be created. Tables can read data from CSV, JSON, XML, and Excel. You can create a table with charts and a built-in wizard. You can highlight cells, rows, columns whenever you want. You can use conditional formatting in CSS. Real-time table data customization and the end user can edit anytime. wpDataTables lets you show data in a comprehensive way. Here’s an example of a table created with wpDataTables. wpDataTables is both tables and charts creator plugin. This is the best plugin if you want create large tables. It’s a premium plugin which costs $55. WP Table Manager is a premium WordPress table plugin which is introduced by JoomUnited. The plugin supports extensive functionality with pre-built style themes that actually allows your tables look exception. It has two blocks to insert tables and chart in Gutenberg editor. You can have an editor like Excel. Table theme style can be customized. Data can be imported from multiple sources like Excel, Google Sheets, WordPress database as well and so on. Excel and Google Sheets can be synchronized. Using this plugin you can have basic formulas like SUM, COUNT, etc. To generate a chart, you can integrate chart.js file. One of the best selling points of WP Table Manager is that it lets you create any type of table. 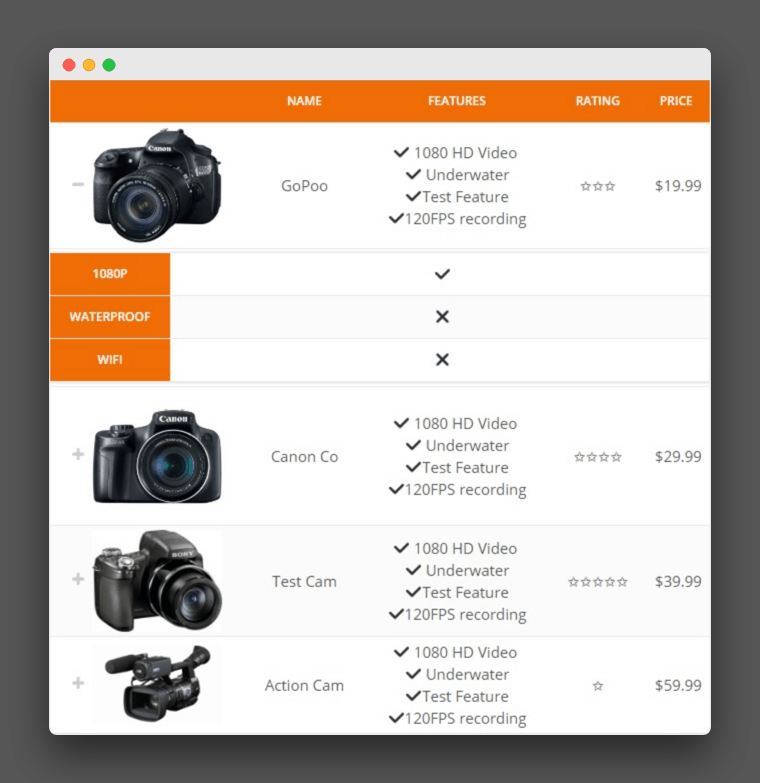 You can create pricing tables, comparison tables, planning tables, etc. Here’s an example of a simple plugin. The best thing about WP Table Manager is its pre-built templates. It’s a premium plugin that costs $39 for one year support and updates. League Table is a premium table which was built with sports in mind but later it gets the choice for average table-creator. 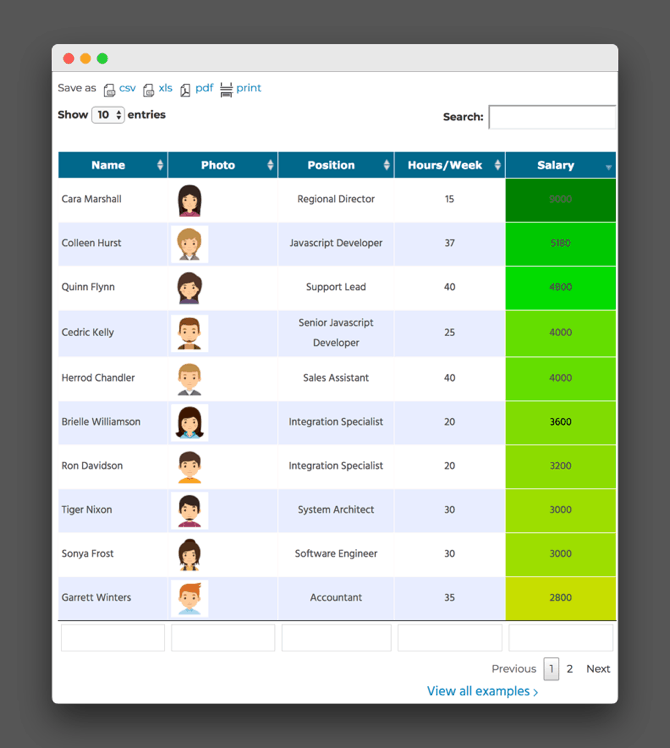 The interface is simple and handy as you can set up the number of columns and rows, key in the table heading, then you can type away into the cells. The table can be sorted easily using the plugin. Moreover, you can have an advanced option which reveals a notable amount of customization ability. You can correlate the row to the pixel table dimensions and logo display are all possible. Pretty simple to use and easier to use excel. Responsive setting depending on the different devices. Adding mathematical formula to the cells, rows, and columns. 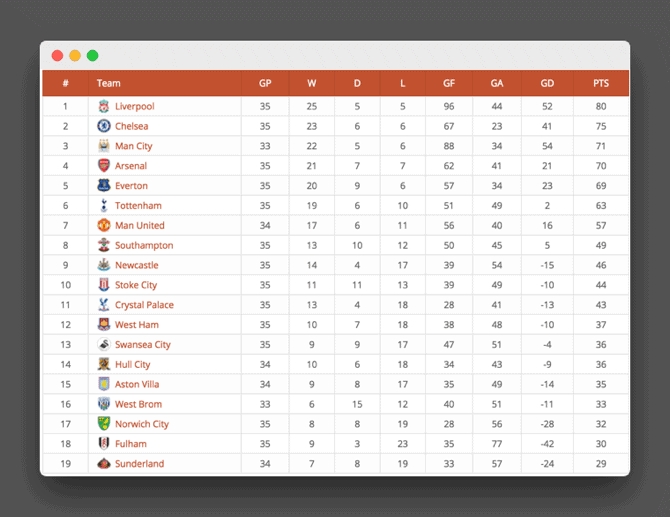 As this plugin is mainly created for showing League Table, a typical table created with League Table looks like this. As it’s mainly created with sports in mind, it’s better to use it on League types table. The plugin costs only $23. Data Table Generator is a simple & free table plugin which allows you to create responsive tables. Using this plugin user can have interactive experiences. It renders interactive charts and graphs. It also provides sorting, pagination, filtering etc. It’s a responsive table builder WordPress plugin. It has many features and functionalities to make your table more interactive. One of the great features of the plugin is, Server Side Processing. It allows you to load huge tables. The plugin has Formula and HTML tables support for data at the same time. Table caption, header, the footer can enable and disable. A wide range of customization facility like bold, font size customization, color customization etc. Data importation facility from CSV, Excel, Google Sheets. You can also export the table to CSV, Excel, PDF. Data Table Generator lets you add tables with calculations, sorting, filtering, graphs, and charts. It’s one of the most powerful table plugins. It has some amazing features like evaluated formulas, data sorting, diagrams, chart, & graphs, etc. It has both free and premium version. The premium version costs $29 for one site. This plugin is slightly different than the conventional one, as it provides you a twisting experience as a whole. Using this plugin, you don’t need to enter data into the post manually. Instead of doing so, it generates the tables simply based on existing WordPress posts, pages or custom post types. This table plugin gives you ample of flexibility while you want to display data as a post or custom post type. Visitors can decide how many rows to be displayed in a page and they also filter the post by tag or category. You can add an additional filter here simply by adding the shortcode. Any kind of post, pages and custom post can be displayed by this plugin. Table columns can be customized including all the standard WordPress data plus custom fields and taxonomies. Tables created by the plugin is searchable, sortable and filterable. The plugin allows its users to add multimedia like audio and videos. The plugin has its responsive look. 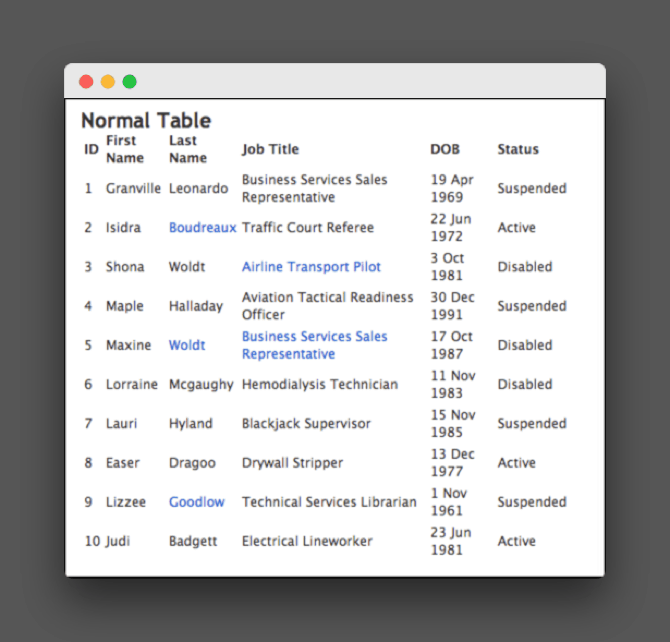 Unlike other plugins, Posts Table Pro lets you create tables without any data entry. 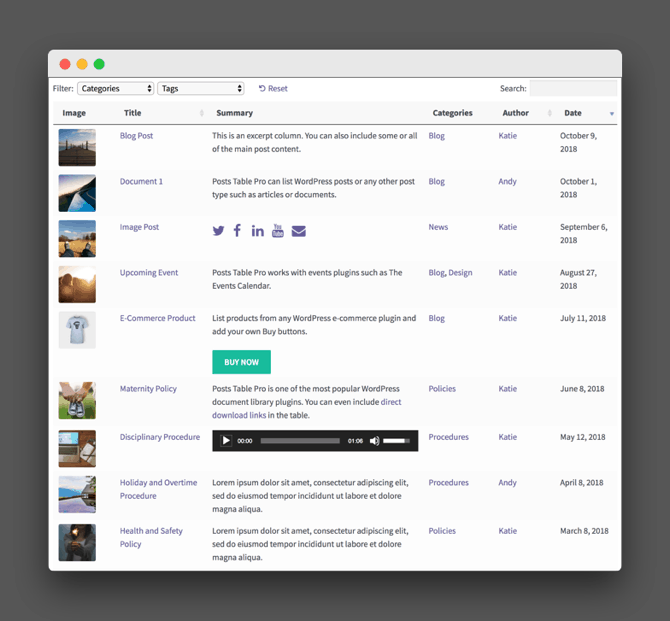 You can easily generate tables from posts, pages, documents, audio, custom post types, etc. It’s not the right plugin to create tables from scratch. It mainly creates tables from post types. It’s the best choice for document libraries, directories, events, etc. It has both free and premium version. The premium version starts $89 for a single site. Ultimate Addons for Elementor is one of best add-ons plugins for Elementor. It has 24 Elementor widgets. One of the coolest widgets is Table Widget. Table Widget lets you create responsive and beautiful tables with advanced styles and features. It has some advanced features like sorting option, merging or spanning of rows and columns, searching option, dropdown entries for longer tables, and more. Searchable Tables With Dropdown Entries. A Table Created With Ultimate Addons for Elementor. Ultimate Addons for Elementor lets you create any type of table by using Elementor Page Builder. Here’s an example of a comparison table. As it’s an Elementor Add-ons plugin, you need to have Elementor installed on your WordPress site. It’s a premium plugin. The price starts at $69 for unlimited sites. Magic Liquidizer Responsive Table plugin allows you to create a responsive table and transforms the simple HTML tables into a mobile-friendly table on your web page. To manage data from the small screens where usually data overlap, it’s an easy solution to solve the issue. To give an elegant view of the data, the plugin also can collapse the columns into rows. Navigation and custom media queries are in the pro version but its basic functionalities are free. It provides responsive outlook with images, texts, forms, navigation menu, and the total table. checkProvides advanced features of SEO, navigation, and custom media queries. checkThe plugin also supports landscape and portrait view. The plugin’s interface is simple and lightweight. It’s a decent solution to create basic tables. 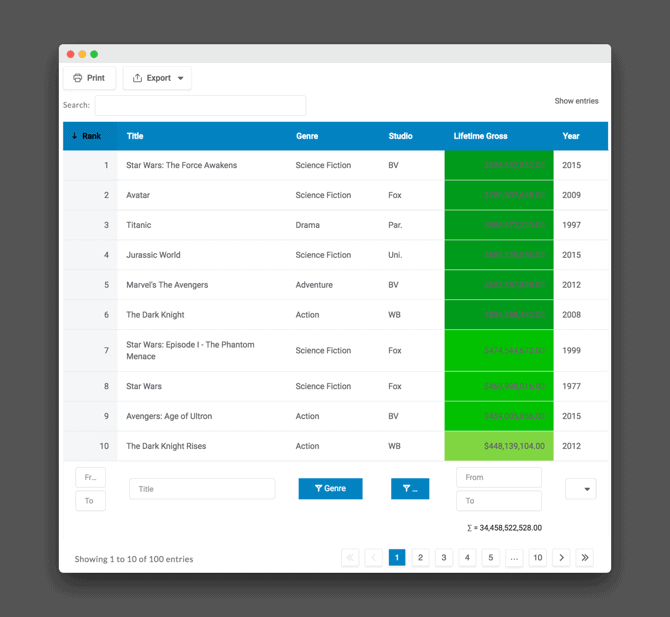 JTRT responsive Tables plugin which is used to create responsive tables without any having any coding knowledge. It’s a beginner-friendly plugin, that can use anyone out there. You can customize table cells from the backend. Images and links can be added to the table. Custom breakpoints for each table. You can have three different responsive types. Custom border, alignment for the cells. You can use a keyboard shortcut as well. It supports WYSIWYG table editor. And you can customize the font in different ways. Th plugin is fully free. Conclusion: Which Is The Right WordPress Table Plugin For You? So these are the best WordPress Table Plugins out there. Hope you have chosen the right plugin for you. If not, here are some of best recommendations based on different requirements and criterions. I’d definitely recommend Nina Tables for better user-experience and responsiveness. It’s the fastest growing freemium plugin. This would be a great solution if you want to create large data table. Responsive breakdown facility can add extra value to your table. You can have lots of functionalities on the free version. In that case, TablePress could be a smart solution for you. This free plugin has everything you need to create a simple table. wpDataTables is for you. This premium plugin makes data export-import insanely easier. Ultimate Tables is the perfect choice for that. League Table is a premium plugin that only costs $14. You can try this plugin for having a simple premium solution. WP Table Manager come with 6 pre-built table themes. In a nutshell, I would say that all the tables here are more or less perfect embodiment of creating the table on your web pages. More or less, they all are serving the same aspect. Now let us know which plugin are you using to create tables in WordPress. Love The Design Of This Post? We use Ultimate Blocks (Custom Gutenberg Blocks) plugin to design this post. It’s a free plugin. You can install it from WordPress Plugin repository. Awesome list of best WordPress table plugins. There are lots of WordPress plugins available for creating tables, but we must have a right plugin in our pouch which can fulfill our needs. 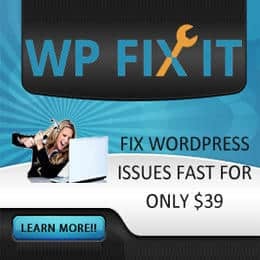 Here, you have well explained the features of these WordPress table plugins. Here, I have found some new and worthy WordPress table plugin.